What is the correct protocol to handle a passenger bringing a live lobster onto an airplane? This is neither a personality test nor a trick question. It was the reality for some Southwest Airlines gate agents in Denver over the weekend as a crustacean arrived at the gate. There’s no word yet on whether it was an A-List member or not, but the arthropod did not make it on board, at least not in the cabin. After consulting with various authorities the decision was made to put the lobster in a container and have it travel as checked baggage on the flight. Both the lobster and the passenger arrived safely at their destination where, presumably, a pot of boiling water was soon sourced to help finish off the day’s festivities. And, while it is not a dog in a bowtie, the lobster also was not, as best as I can tell, declared as an emotional support animal. Or maybe it was. That part of the story remains unclear. To do so would have been an impressive attempt given the requirement that such animals be trained to perform said tasks. Then again, that requirement certainly has not stopped some passengers from making the claim for their pets. It is unclear how the TSA got involved in the conversation. The lobster was identified as an issue at the gate, not at the checkpoint. And flying with live lobsters is not especially uncommon, particularly departing from New England coastal airports. Legal Sea Foods’ LTK outpost in Boston’s Terminal A advertises lobster packed to go. So does Linda Bean’s Maine Lobster in Portland, Maine. Sure, that’s different than Denver, but it’s hard to believe the TSA rules on this issue might vary by airport. Maybe the rubber bands slipped off the claws so the pinchers were considered dangerous?? There’s also the internal notes from the flight that don’t mention TSA communications at all, though it does mention a call to headquarters to ensure that rules and processes were being followed correctly. 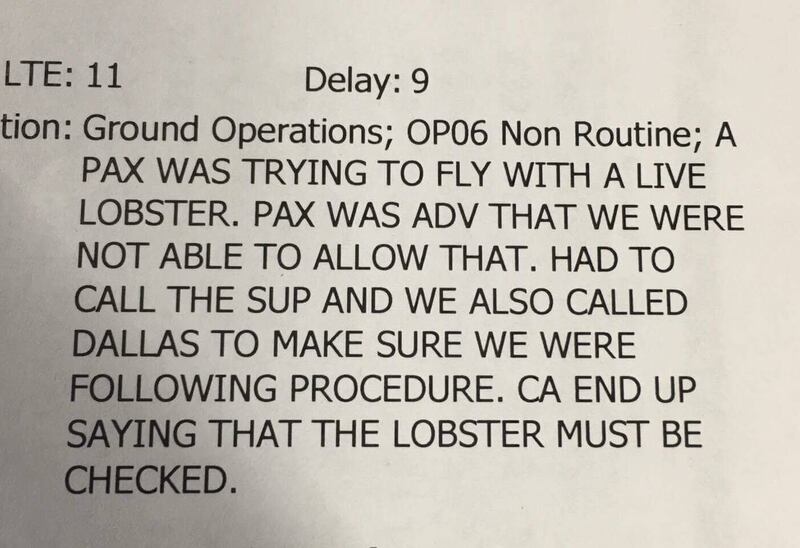 And it closes with “CA END UP SAYING THAT THE LOBSTER MUST BE CHECKED.” In this context that means the Captain on the flight made the final call, not the TSA. Or at least that is what is documented here. On the one hand, none of it really matters since the passenger and the lobster made it to their final destination unharmed. There was no brawl (or bawling) at the gate and everything seems to have worked out in the end. Still, a most bizarre set of circumstances and the idea that a lobster cannot be brought into the cabin is a strange one to me. Especially if they were able to find a sufficiently sturdy box to pack it in for the baggage compartment. Boil it at the gate? Let it ride in the tail of the plane. Very common out of BOS in the 90s. It’s an ESL: Emotional Support Lobster. Steam and serve with butter! Pop open some sparkling wine and have a nice meal! Was it an exposed Lobster, or did it have claw restraints? Was it snapping it’s claws? Was it contained in a lobster stroller, or free to roam? Get a pot of boiling water…. ESAs do not need to be trained to do anything. In Halifax they pack it in a box with a couple packages of frozen peas to keep it cold.